We’re not there yet! Why we must keep fighting for artists, makers, independent shops and small businesses! I hadn’t intended to write this blog post, but a number of things happened which stirred me up so much I felt compelled to charge to the keyboard. Much of this campaign has been driven by an impassioned emotional response - even the quote on which the campaign is based “If everyone who’d complimented my beautiful gallery had bought ‘just a card’ we’d still be open.” I couldn’t get it out of my mind and look where that got us! First and foremost, this campaign is a celebration of creativity. We’re upbeat, passionate and positive, yet we don’t avoid the realities of small business life. This is a platform to share challenges to help us all keep doing what we love most - making, creating, sharing amazing artwork, goods and services for those who value creativity, provenance and community. Bear with me - this is neither a short, nor entirely sweet, post but we’re a campaign - for change to happen we need to be bothered to think and react. Only by discussing issues in a positive and respectful way, and working together, will we achieve our wider aim - to encourage people to support, value and buy from artists, makers, independent shops and small businesses. As we hurtle towards Christmas it’s important to remember that, whilst often a happy time, it can also be emotionally and financially draining for many, and for small businesses especially, as this time can often mean make or break. Many of us are visiting or taking part in Christmas markets or events, either as buyers or sellers. That so many people value independents and work so hard to support them is hugely appreciated. To those visitors leaving with something extra special tucked under their arm we say “Thank You - you are the bee’s knees”. Though sadly not all visitors leave happy. A number of Classic FM listeners got in touch when they heard a Classic FM presenter relay her experience of visiting a market. Listen to the clip below. We were all saddened to hear these comments, and a little surprised too given this is a classical radio show. We’ve tried on several occasions to contact the presenter to open a friendly dialogue, but received no reply. We had hoped to send her the letter which we’ve added at the bottom of this post, which we’d written in response. The presenter is of course entitled to her opinion, and there is no reason why she should choose to support small businesses. However, we thought it’d be helpful to explain just why those items had the price tags they did, and why, as a maker, hearing her comments is quite hurtful. Part of our jobs as artists, makers, independent shops and small business owners has to be defining what sets us apart. One of the things we’re trying hard to do with this campaign is tell the independent’s story - we can’t simply shout SHOP INDEPENDENT - no one owes us a living, it’s up to us all to share the stories behind our craft, our skills, our work and our beliefs in provenance, creativity, environmental impact - why buying cheap often comes at a price. By doing so people will hopefully begin to see the value of buying into this and how this affects the world around us. If this resonates with you, remember we’re 100% behind you. We understand that it’s tough but it’s tough for loads of people, if it wasn’t we wouldn’t have a campaign! Everyone who’s ever done one of these shows knows just how emotionally charged they are. Like any shop owner too we invest so much love, passion, work and time into them. Often they’re pretty costly too (I once has a visitor say she was amazed I had to even pay to do a show - one which had cost nearly £1.5k!!). There’s no doubt exhibiting in a big show like Country Living can be a great experience for a small business - I’ve personally done 3 of them and they’ve been brilliant. Country Living work hard to support & promote small businesses and they’ve even featured the campaign in the magazine this month. Hooray to them! However, it’s important to go into any event with your eyes open so you can make them work for you. Work with the organisers to attract footfall (ALL the show organisers work their socks off so shows are a huge success. They are behind you every step of the way - promotion etc has to be a joint effort - you’re all on the same team - we all are! ), work your Social Media, give out your ticket allocation, talk to people, suggest where they could put your work, build a mailing list. Customers are often repeat customers and if ever I’m offering small businesses advice (which is very often! ), I always say ask every customer or interested people for their email address. I’d be lost without my client database and these big shows can provide you with lasting contacts and further sales long after the emotions have settled. “I love your campaign to encourage people to support Artists etc - here's details of my work - please promote it etc...."
Do hop over to Instagram (and follow us) and read the post - it’s very obvious which one it is - loads of you have commented too. You all appreciate that JUST A CARD is about the bigger picture. We’re not a platform for individuals to promote their work, we do try with HAVE YOU MET? !, but ultimately we’re about a community as a whole, and not just one for artists and independents, one for every single person who is concerned about independent shops closing, your bakery, local bookshop, toy shop etc., and the arts in general. 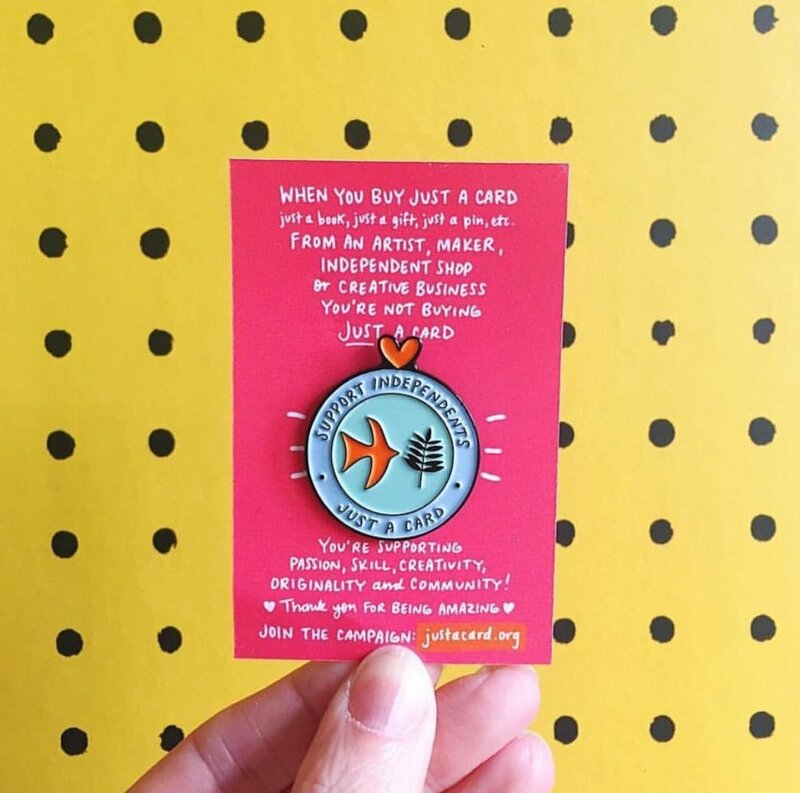 For those of you who have events coming up over the next couple of weeks, we’ve started a brand new hashtag on Instagram #justacardshows to help you to show them off so people will find you! So shout loud and proud about your next market, late night opening or Christmas shopping evening over on Instagram using the tag - here’s the lineup so far! My point is this: JUST A CARD has had considerable success lately. Thanks to our incredible partners FUNDING CIRCLE (follow them on Instagram here) there are now over 10,000 window stickers in shops all around the country. Once again a HUGE Thank You to FUNDING CIRCLE for all their help and support. We’re so grateful for their generosity - please do follow them on Instagram, and on Twitter. You will be amongst friends! So many people are benefitting from this increased awareness. Loads of shops say customers pop in to buy JUST A CARD, or anything small, because they know what a difference it makes. Lots of makers feel supported and valued and part of a community, which is great because so often we work alone. To people who want their town to thrive JUST A CARD is their community too. If ever there was proof of how much impact we’re making it was the quite extraordinary success of JUST A CARD - INDIE WEEK! Wow - We’re still recovering from that amazing week. As you know we were on BBC TV News, on Radio and in The Guardian too (and more beside) - it’s great to see this community getting the recognition it deserves! If you missed The Guardian feature here it is again. All this has happened because of YOU! You sharing, you caring, you promoting the message. We simply can’t rest on our laurels. We need to get more active. We need to get loads more window stickers up and posters at every event. It really is tough for independent shops at the moment, you only need read Hannah in Hebden Bridge’s tale, and Focus Gallery in Nottingham has also shared a very concerning story. We’re losing shops at an incredible rate, and that has to stop - our campaign IS working, but there’s so much more we need to do. Errr No - I didn’t think of it. Well there you go - it’s too late now. Our stickers DO turn browsers into shoppers. Who knows - those extra few sales made by shoppers seeing our stickers could have been make or break. Let’s double the stickers out there - if everyone who follows us on Instagram gave out just one sticker, or told a beloved shop about the campaign just think what an impact we’d make. The little things add up! Let’s work together to stop it being too late for more shops. Don’t forget to get your pins. Funding Circle have, again incredibly kindly, helped us with a new batch so sales can spread the word and fund the campaign too! Amazing - Why not give one to a friend for Christmas?! Let’s work together to make sure people appreciate all small businesses and creatives. Our businesses. Our towns. Our futures. 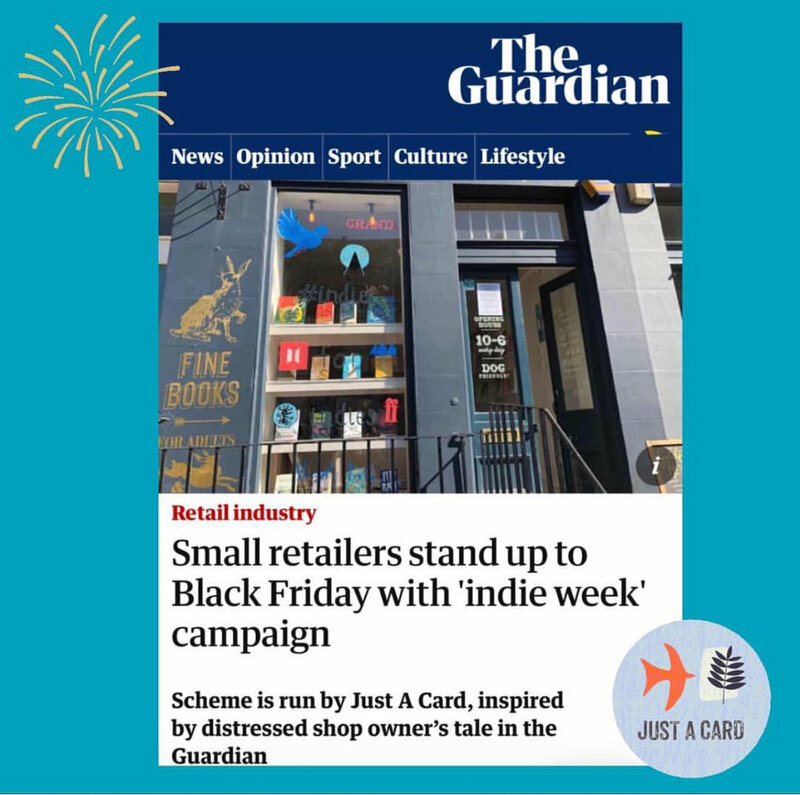 We run a not-for-profit campaign called JUST A CARD (justacard.org), the aim of which is to celebrate artists, designers, independent shops and small businesses and encourage people to value and support them. Here’s a recent feature in The Guardian which tells you more. Some of your listeners have brought comments you made on air about attending a Christmas market to our attention. From this it seems you’re perhaps unaware of the considerable emotional and financial investment which goes into both the work and the promotion of exhibiting at these markets, and how your words could be be a little hurtful. If you were the person who’d turned up on the same rainy day as you to try to make a living you’d feel rightly saddened if someone dismissed your hard work on national radio, even going as far as saying you couldn’t get away fast enough. Christmas is such a crucial time for artists, makers and small businesses and many are working hard to positively promote their work, not just the artist themselves but press, small business associations, shop owners etc. and even campaigns such as ours. There is no reason whatsoever why you should be one of them, and you are of course entitled to your opinion, but those in your audience, as you say so yourself preparing for their events, were surprised to hear you speak in this way. Perhaps on a different radio station this would be less surprising, but your audience, we’d imagine, are people who support and respect the Arts. We’d welcome the opportunity to talk you through the hours of love and labour which goes into a £185 scarf or that bus pass holder, the materials, time spent studying for a art/design degree or MA, not to mention the often considerable costs exhibitors pay to even have a stall at these markets! This would explain why most artists and makers don’t sell ‘bargains for under £10’. We’re not embarrassed by our prices - we’re proud of the quality of the work and the bespoke services we provide and the price (often under!) reflects the commitment of labour, materials and skills. Please don’t perceive this as us being over sensitive. This is more than hurt feelings - it’s about people’s fragile livelihoods. We’re well aware that £185 is not within everyone’s budget, yet there’s a distinction between what can be deemed ‘expensive’ and what a person chooses to spend their money on. We’ve shared this open letter within this blog as people were keen to hear our response. We were sorry not to hear back from you, despite contacting you a number of times. We had hoped to have a friendly chat about this to perhaps find a positive way to counter these remarks, as we’re sure it wasn’t your intention to offend.